I teach a portrait lighting class on using available light and also cover the same sorts of topics in my online course Portrait Fundamentals. What size gray card is best? With a multitude of different sizes available, which one should you buy? My answer would be – it depends. 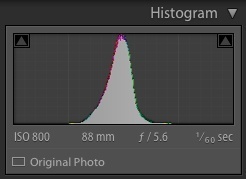 If you want to use it to do custom white balance in-camera then I'd suggest a slightly larger one because you have to photograph it and crop out everything else. That's very hard to do with the business card sized ones. If you only plan on using it to meter off of, or use for color correction on post-production later then you can get away with a smaller one that will fit in your pocket or camera bag nicely. This one (left), or something similar, is a great option. It's large enough to photograph, has a target on it so you can focus the lens, and folds down small for ease of portability. Another part of that question is why to use a gray card for white balancing in camera. My answer is two fold. First I almost never do custom white balance in camera. It's a pain to do, slows the photo session down, and if the light changes you have to do it over again anyway. Second if you're dealing with a mixed lighting situation – such as daylight from a window and overhead fluorescent lights – then doing a custom white balance in camera is a good solution to handle that and get a neutral color to your images. As I mentioned above though – keep in mind if you move away from the window, or the overhead lights get turned off – then you'll have to do it again as the color will shift. Having said that – if you want to give it a go here are the steps. They are slightly different of Canon and Nikon (if you use something else like Fuji, Pentax, Olympus, etc., check your manual for how to do this procedure). Take a photo of the gray card – you need to make sure there is NOTHING else in the shot. You should see nothing but the card. If you have one without a target on it, your camera will not be able to focus on it, so switch to manual focus and take the shot. It's okay if it is not sharp – that doesn't matter. You should have something that looks like this. If you see anything other than gray – get closer! Navigate through your menu until you find where it says “Custom White Balance” or something similar. It will then ask you to choose an image, do that in the next step. Select the image of the gray card you just took. It may ask you “Use WB data from this image for custom WB” – select OK.
Set your camera's White Balance setting to Custom. It's the funny looking symbol that looks like a square and two triangles (see below). Inside your camera's menu find White Balance on the shooting menu options. Scroll down until you see PRE setting (below) and highlight that. 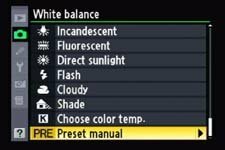 It stands for Preset and is Nikon's terminology for custom white balance. Hold down your WB (white balance) button for a few seconds until your LED display is flashing. Alternately if your model doesn't do that, find the PRE setting in your menu and press your toggle to the right, choose “Measure” and set for Okay. Take a photo of the gray card (follow the directions for that above). You're done, it should now be set. That's the short version of how to do it. If your camera doesn't have those settings refer to your manual or do a quick YouTube search for the words “custom white balance” plus the name and model number of your camera. There is probably a video showing how to do it with your camera step by step. There are so many variations and cameras I can't show them all here unfortunately. Your camera has a built-in meter that reads the amount of light and sets the exposure (or gives you information so you can do it if you're shooting in manual mode). But sometimes it gets it wrong such as when you're shooting a white subject, or a really dark one. That is because your camera is measuring and setting to make everything medium or 18% gray. Read more about how metering works in your camera here: Why is the snow gray in my winter photos? You can use a gray card to help you set the exposure in such situations. It is ideal to use this technique for portraits using natural light when the lighting remains constant, and circumstances where you have the time to setup your shot, use a tripod, and do a custom white balance as outlined above. It is not the time to use a gray card for metering when you have a moving subject or the light is changing rapidly. Notice in the photo above the model is holding the gray card in front of her. 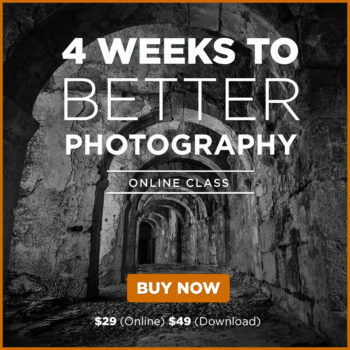 Get your subject to help you by doing this, or prop it up in your shot somehow. Make sure the gray card is facing the camera straight on, as sometimes the slightest tilt or turn to one side can change how much light is bouncing off of it, and that will affect your exposure reading. Set your camera to manual shooting mode. 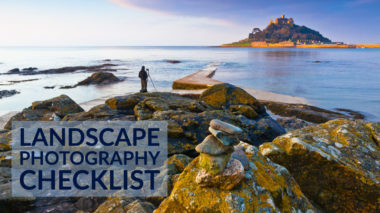 Select the ISO and aperture you wish to use for your shot. Set your camera's metering mode to Spot Metering. This will allow the camera to read a very small area only, helpful if you only have a small gray card. 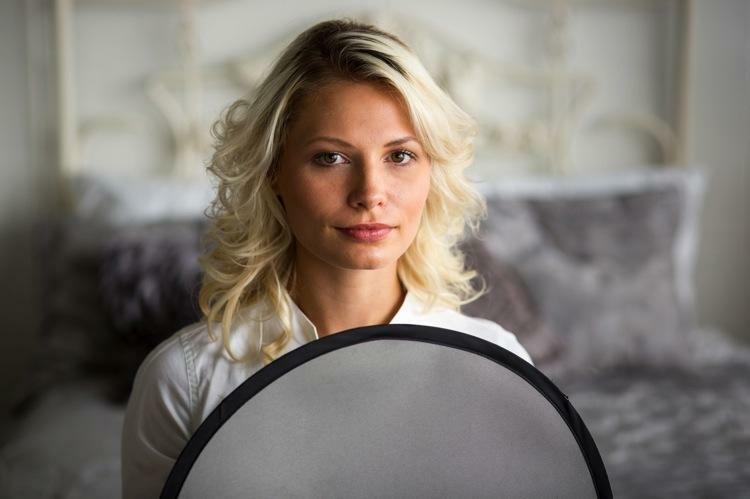 You only want it to read the light off the reflector only, not the entire scene. Set your focus point to single and choose the center one. 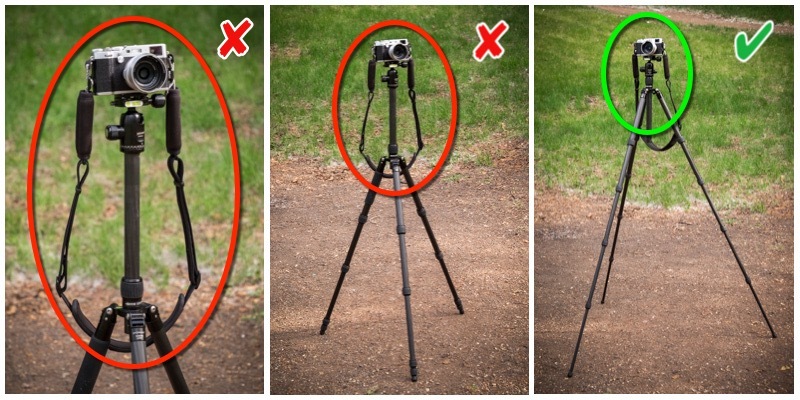 Your camera will meter the same place it focuses. Aim your camera at the gray card and press the shutter button part way down to take a reading. Looking in your viewfinder (eye piece) adjust the shutter speed until it gives you a reading of “0” (zero). 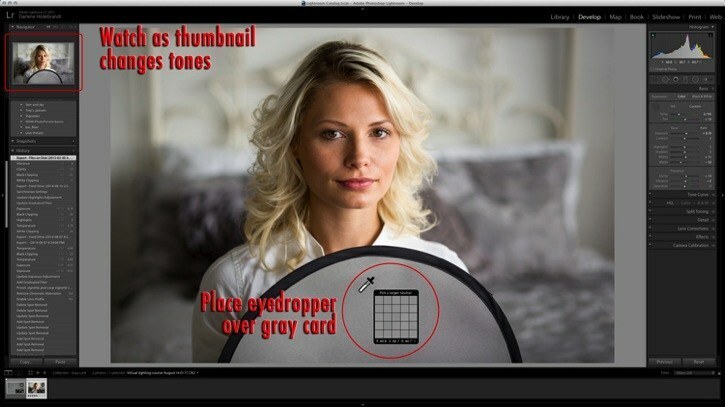 Review the histogram – you should have a perfect exposure with the gray card and all tones falling in the correct zones. If you shot only the gray card you should see one like below. Note: if your lighting changes (gets brighter or darker), or you add a reflector or fill-flash you will need to meter and repeat the entire process again. Notice how large my gray card is in the photo above. 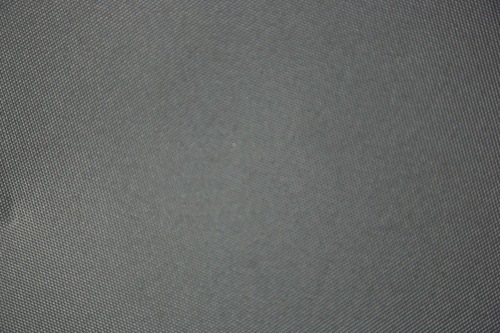 It is actually the back side of the cover for my large 42″ reflector. The Promaster brand has that, others might too. Look for that a as bonus when you're shopping for reflectors – kill two birds with one stone (I'd never kill a bird, just for the record). If you followed the steps above and included a shot of your gray card and your subject you can do a custom white balance in post-production. Both Lightroom and Photoshop (and likely others, I'm just not familiar with them) have an eyedropper tool you can use to do just this. 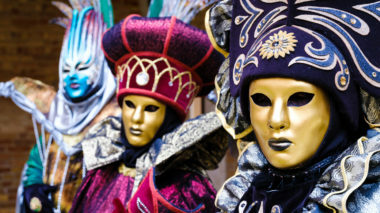 Open your image in Lightroom, Photoshop, Elements or whatever raw processor you use. This demonstration uses Lightoom so the screens and tools might look a little different if you use something else, the the process should be similar. Go to the Basic editing panel, in Lightroom that's the Develop module, first panel, top right. 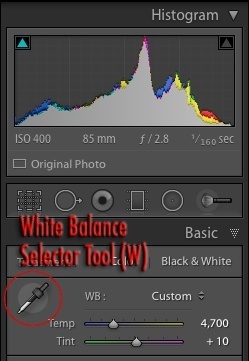 Find, and click on, the White Balance Selector Tool. It's the eyedropper you see circled below. Place it over an area of your gray card in the image, as shown below. Watch the thumbnail of the image (top left) as you move the eyedropper around on the gray card. When it looks like a good color to you, click there. Lightroom will neutralize any color in the spot you cocked making it perfect gray. Tweak your Temp and Tint sliders a bit to your tastes. 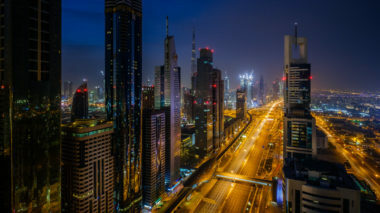 Now you can use copy and paste, or Sync to copy the color settings of this one image over to all the others shot using the same lighting setup. So that's it. Using a gray card can be handy if you have the time to setup and do a few extra settings. If you have one in your bag, or on the back of your reflector try some of these tips out and let me know how it goes. Do you have any other techniques for using a gray card? Please share in the comments below.